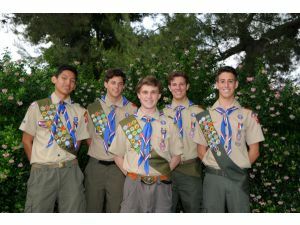 Three of the five recent Eagle Scout rankings are graduates of JSerra’s class of 2013. Daniel Bondi, Xavier Puga and Andrew Wasilewski each completed the rank while as high school seniors. “Scouting means to me a time of growth as a young man on the road to become the man I am today,” said Daniel Bondi. “I’ve learned that with hard work comes great accomplishment and that the right mind set will get you far in life,” said Xavier Puga. “The pain of discipline is short term, but the pain of regret lasts a lifetime; and that if you do something that scares you everyday your life can never be boring,” said Andrew Wasilewski. Three have been together in Scouting since first grade, and all came together by fifth grade, when they bridged into Boy Scout Troop 724 – sponsored by the Rotary Club in San Juan Capistrano. Of the original 14 members of Troop 724, six reached the Eagle Scout rank. After graduation, they celebrated their achievement together, along with families and friends, at a joint Eagle Court of Honor on July 21 at the San Juan Capistrano Community Center. Mayor John Taylor presented each of the boys a special commendation from the City Council. They are among the select few achieving the rank – in the Orange County Council, BSA in 2012, 743 young men attained the rank, among 28,000 youth served. In addition to earning five previous ranks and at least 21 merit badges, each Eagle envisioned, negotiated, planned, financed and led a service project to improve the community. Bondi led the construction of two large, portable cabinets for Family Assistance Ministries in San Clemente, storing clothing for the homeless to use for job interviews. Puga led the assembly of “urban survival” backpacks for the homeless, packed with basic essentials. Wasilewski led the installation of a fence protecting another section of the vernal pool at The Reserve.